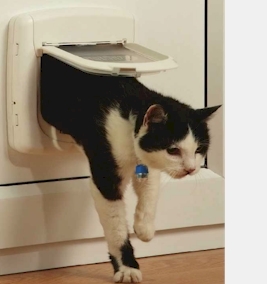 Staywell Deluxe Infra-red Cat Flap. Battery operated Infra-red collar key and cat flap helps keep out unwanted cats. Your cat wears the Infra-red collar key which when in range of the cat flap, triggers it to 'unlock' allowing him safe entry to the home. Suitable for most materials and can ustilise tunnel extensions to fit any depth of wall. Available in white and suitable for cats up to 7kg. Only your cat's collar can activate this flap. Infra Red Key - BLUE Part No.REL580BLU For Use With Compatible with the Staywell Infra Red Cat flap only Number of Keys Supplies 1 Key, 2 Batteries, & 1 Collar Keys weigh 8 grams (with batteries installed) Important - Your Staywell Infra-Red Cat flap is supplied with 1 colour coded ..
Infra Red Key - Green Part No.REL580GRN For Use With Compatible with the Staywell Infra Red Cat flap only Number of Keys Supplies 1 Key, 2 Batteries, & 1 Collar Keys weigh 8 grams (with batteries installed) Important - Your Staywell Infra-Red Cat flap is supplied with 1 colour coded..
Infra Red Key - Pink Part No.REL580PINK For Use With Compatible with the Staywell Infra Red Cat flap only Number of Keys Supplies 1 Key, 2 Batteries, & 1 Collar Keys weigh 8 grams (with batteries installed) Important - Your Staywell Infra-Red Cat flap is supplied with 1 colour coded..
Infra Red Key - Yellow Part No.REL580YEL For Use With Compatible with the Staywell Infra Red Cat flap only Number of Keys Supplies 1 Key, 2 Batteries, & 1 Collar Keys weigh 8 grams (with batteries installed) Important - Your Staywell Infra-Red Cat flap is supplied with 1 colou.. Description Transparent Flap includes lower magnet 143mm h x 153mm wide For Use With Fits 300 400 and 500 Staywell doors Manual, Magnetic & Infra-red .. This pack is for the Staywell 300 Deluxe Manual Cat Flaps, 400 Magnetic Cat Flap and the 500 Infra-Red Cat Flap Contents: The replacement part kit includes the 4-way lock with knob, Installation screw pack, Flap Magnet White finishing plugs, grey finishing plugs, woodgrain finishing..